How to a Build a Mobile Survey App? Are you an entrepreneur trying to conduct a market survey using mobile apps? Or, a developer working on a mobile survey app? The number of mobile devices is growing, and will grow further, as you can see in “Number of mobile phone users worldwide from 2015 to 2020 (in billions)”. As a result, surveys, a valuable tool for market research and several other purposes, are increasingly moving to mobile apps. Now is as good a time as ever to learn how to build a mobile survey app, and I will explain that in this guide. First, identify whom you are targeting with the mobile survey app, so you know what their requirements are. Make your questions shorter, remove unnecessary words. Avoid large text boxes, long dropdown panels, and a lengthy options list for a multiple-choice question. These are hard to manage on mobile screens. Don’t make the user scroll up and down for responding to your survey. Break the survey into small sections. Avoid images and videos, they may consume battery and mobile data. Use a mobile data collector app instead of a web browser-based survey. Test your survey on all popular mobile platforms. Read more about these best practices in “8 Steps to Making a Mobile-Friendly Survey”. There are different approaches to develop a mobile survey app. Your choice depends on how quickly you need to get it up and running, and how skilled your team is. If you want to roll-out your mobile survey app very fast, you would likely want an approach that requires the least amount of development. On the other hand, if you want plenty of customization, then you might want to code everything in-house. This is your easiest option, hence if you are an entrepreneur in a hurry to do your market research, this is your best approach. I have a tip for you – Consider using Opinionmeter! 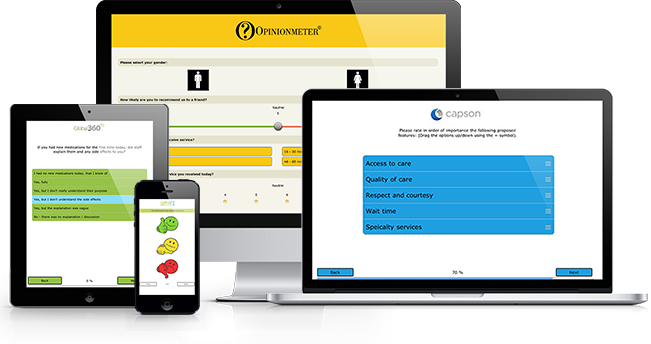 Opinionmeter is a cloud-based enterprise survey platform with a customizable mobile app. Their mobile survey product is “TouchPoint Mobile”. 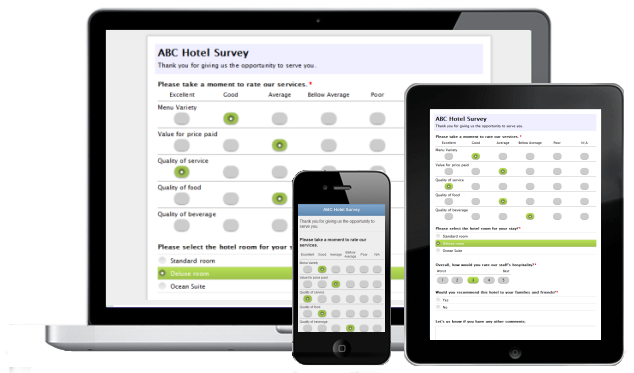 You can create, deploy, and manage your mobile surveys on any mobile device. There are no country or language-specific constraints. They support all major mobile platforms, like iOS, Android, and Windows. TouchPoint Mobile is a native mobile app, and their extensive functionalities work across all smartphones and tablets. You can set it up and deploy easily. TouchPoint Mobile allows you to collect user responses offline. The app detects it when there‘s no Internet connection, and stores data locally. Data synchronization is automatic when the Internet connection is back. You can set up your survey with a professional and touch using this platform. It‘s also fully responsive, i.e. your customers can view it without hindrance irrespective of the device. You can customize your survey with your branding. You have the complete ability to use your logo and colors. The platform captures rich content, for e.g. video. It also supports all languages, including ’Right to left justified‘ (RTL). There are Geolocation features allowing you to identify the location of your individual prospects or run location-based analytics. It supports over 35 question types, and you can embed images and video content in your survey. To top it all, they also have predesigned survey templates for different kinds of survey. Check out their templates, you may be able to save even more time! Several mobile survey providers offer their SDKs, and in this approach, you can make a mobile survey app using an SDK of your choice. This approach isn‘t as straightforward as configuring the TouchPoint Mobile platform. You need a development team and your team needs to learn the SDK. However, it‘s significantly easier than the Do-It-Yourself (DIY) approach. I provide a summary of mobile survey SDKs. It‘s compatible with iOS, Android, and React Native. Check out the Mopinion website for more details. Use their dashboard and analytics to make sense of the data. Visit the Apptentive website to find out more about them. There are readymade integrations available for you to work with your project management tools like Trello and Asana. You can visit the Doorbell website for more information. With Pollfish SDK, you can take your survey to a global audience quickly. They are very focused on the survey and have a lot of ready-made survey templates. For e.g., if you are an entrepreneur trying to validate your business idea, you can use their ’target market analysis‘ template. This helps you save time. Demographics are very important from a survey point-of-view, and Pollfish analytics is very helpful in analyzing demographic data. You can use the dashboard to sort and filter data. Pricing depends on the number of surveys, demographics you target, number of questions, and similar parameters. Visit the Pollfish website for details. SurveyMonkey is a reputed SaaS provider offering online survey services. With their SDK, you can send these surveys using a mobile app. You can use their surveys for market research, customer satisfaction, and online polls. You can view real-time results and use their rich analytics to get valuable insights from survey responses. They have a free tier, and then there are premium tiers available. Check out the SurveyMonkey website for more information. UserVoice is another provider of online feedback services that offers an SDK for a mobile app. They don’t exactly confine themselves to the market survey, they also have project management and customer support related features. Their SDK supports iOS and Android; besides it integrates with Jira, Saleforce.com, and Zendesk, among others. Visit the UserVoice website to know more about this provider. In this 3rd approach, I will explain how you can build your mobile survey app with survey provider APIs. This approach is harder than using SDKs because you need to integrate survey APIs yourself. Also, you now need to manage your mobile backend. Mobile backend management can be complicated if your team isn‘t quite experienced in it. You need to manage infrastructure, storage, user management, and user authentication. You must address the multitude of mobile platforms and devices that we have today. On top of that, you need to address various other aspects like push notification, integration with APIs, database etc. All these can become overwhelming, and unless you have experienced backend experts on your team, your launch will get delayed. Fortunately, there is an easier option, i.e. MBaaS. Now, you need to develop a survey and consume the API of the survey provider. You have quite a few choices here, for e.g., Doorbell, the mobile survey SDK provider I mentioned earlier, also offers APIs. Another famous survey platform that provides APIs is “Google Surveys”. You can use it, to create a variety of surveys. There is a wide range of question-types available. You need a Google account first, and then you need to activate Google Surveys API for your account. Use their “Developers console” for setting up authentication. Now, you need to code the survey in the “Developers console”. Check the Google Surveys guide for detailed instruction. You can then segment your audience by demographics. Use their APIs to incorporate the survey into your mobile app. Google Firebase: It‘s a well-known MBaaS provider, and the might of Google will probably make it far stronger in the days to come. They offer their services in three categories, i.e. ’Develop‘, ’Grow‘, and ’Earn‘. They offer a free tier, and then there are premium plans. Apple CloudKit: It’s good for the iOS platform, and lets you easily integrate with other Apple platforms. However, it doesn‘t support any other platform. Kinvey: Gartner Magic Quadrant 2018 report names them as a “Visionary” among MBaaS providers, and for good reasons. They provide a very broad set of MBaaS services. They also provide great learning resources, making it easy for you. AWS MBaaS: Amazon is great with the cloud, and that naturally makes the AWS MBaaS a choice worth considering. They also offer a rich set of services. However, AWS MBaaS isn’t easy to learn. SashiDo: Parse was a very popular MBaaS provider, but they closed in 2017. SashiDo is built on the Parse code base and works just like Parse. Many mobile developers were great fans of Parse, and they love SashiDo! In addition to offering all standard MBaaS services, they also have a great customer support! Kumolos: I am writing this guide mainly for entrepreneurs trying to launch a market survey, or developers trying to build a mobile survey app. However, are you a mobile app development agency, and building mobile survey apps for your customers? Then Kumolos could be a great choice for you! It offers all MBaaS services and offers management portals for agencies, who are their main customers. The most complex of the four approaches, I recommend that you consider this only if you need a very high degree of customization. If your customization requirements are reasonable, the above approaches will likely serve you well. API development – I recommend you develop RESTful APIs, they have proven their mettle. Consult “How to Build RESTful API for Your Mobile App?” for guidance. Depending on your geography, manpower cost could be high, and the overall price-tag for your project could consequently be high. Again, depending on the local labor market, some of the above skills could be premium skills, and sourcing resources could be a challenge. Consider getting professional help. Consider Trello or Asana for your project management and team collaboration. A testing framework for your RESTful API. I recommend Postman. 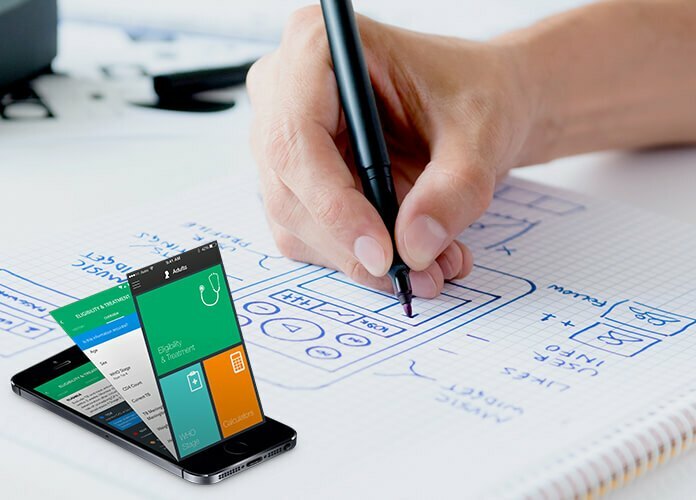 Since this is mobile survey app development from scratch, you need to plan your API well and document it for future ease of management. I recommend Swagger for documenting your APIs. The above is not an exhaustive list, depending on the complexity of your app, you might need to use more tools. You need to run the project with a few parallel tracks, for e.g. front-end development, RESTful API development, and back-end coding can proceed in parallel. Good project management is necessary, for proper coordination among teams. Just as you are developing your front-end, APIs, and back-end code from scratch, you now also need to manage another important aspect on your own. You need to get a good hosting solution for your mobile survey app. Google Compute Engine: This is Googles‘ ’Infrastructure as a Service‘ (IaaS) offering. It‘s known for reliability, scalability, and performance. IBM Cloud: Competitive on all key parameters like network, bandwidth, data transfer, this is certainly a good option. You have both bare metal and virtual server options. Digital Ocean: It‘s a leading IaaS provider and deploying virtual servers and managing them is very easy with them. Rackspace: A major advantage of Rackspace is that they are not only a cloud hosting provider, they are also a reputed managed cloud services provider. Gartner Magic Quadrant Report for 2018 considers them a leader in this space. Read “Where to Host Mobile app Backend?” for more details. To summarize this guide, I have explained four approaches for mobile survey app development. I did this following a continuum, from the easiest approach to the most complex one. If you are keen on getting your mobile survey app out the door as soon as possible, the first option is for you. On the other hand, if you want more customization, you will need to try the other ones, but keep in mind that the complexity will increase with customization. Your cost to build a mobile survey app varies significantly depending on the approach you take. For the first two approaches, SaaS providers provide their pricing table. MBaaS providers also provide pricing tables, so you can get a fair idea of your cost for the third approach. However, you need to build a team and manage it in the fourth approach, unlike the other three where service providers give you their itemized price. Your cost for the fourth approach will depend greatly on your geography and local labor market conditions. How to a Build a Real Estate Platform on Blockchain?